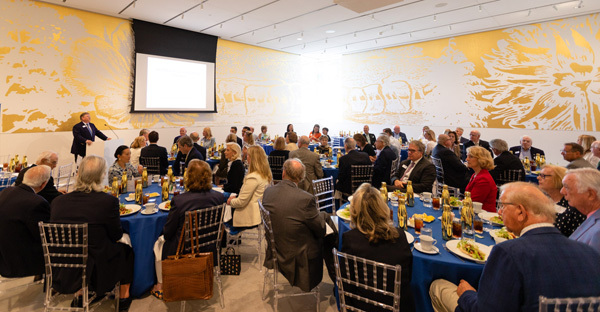 Elliot Bostwick Davis, recently appointed executive director and CEO of the Norton Museum of Art, spoke to 75 Palm Beach Civic Association directors and guests during a March 28 luncheon at the museum as part of the Civic Association’s 75th anniversary season celebration. The “new” Norton reopened on Feb. 9 after completing a six-year, $112 million renovation/expansion project. 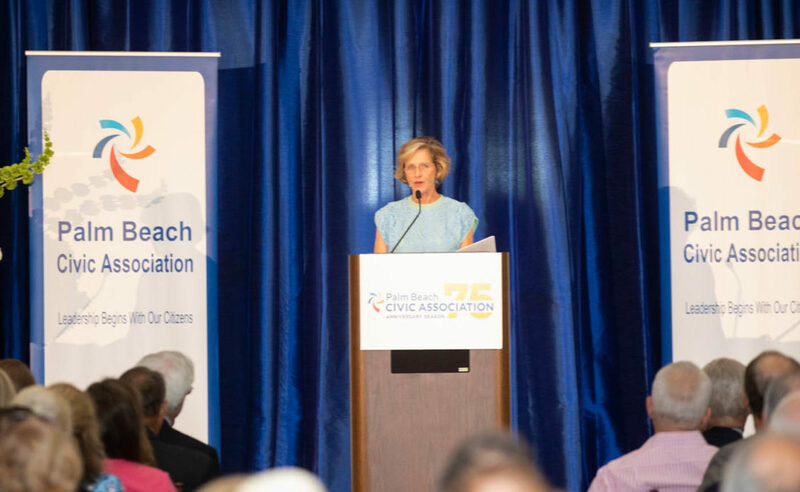 Civic Association Chairman and CEO Bob Wright welcomed everyone to the luncheon and thanked Palm Beach Island Hospice Foundation for sponsoring the event. Mr. Wright recognized Civic Association President Ned Barnes for his 25 years of service to the organization. Guests were served free-range chicken paillard with a cookie trio and fresh berries for dessert. 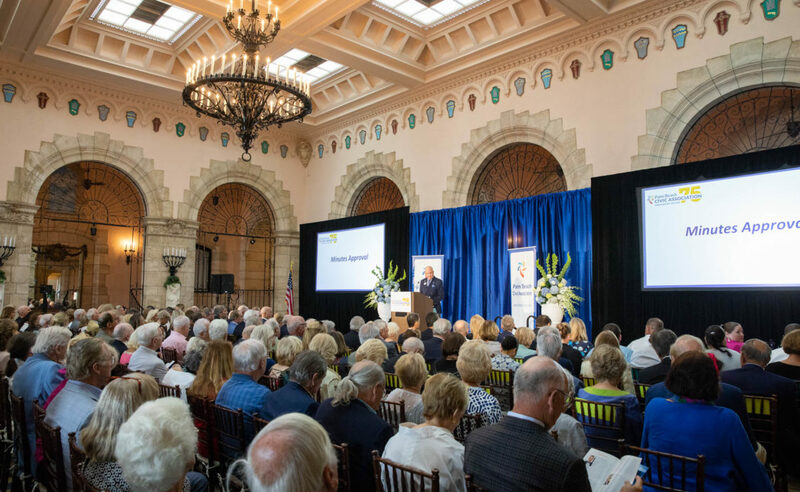 Mark Cook, board president of Palm Beach Island Hospice Foundation, spoke about the work the organization does to provide resources for programs that support end-of-life care for 2,000 patients a day and their families. Bruce Gendelman, first vice chair of the Norton Museum Board, introduced Ms. Davis. He said the Norton board decided to “swing for the fences and hire one of the most important architects in the world, the genius Lord Norman Foster,” to design the renovation/expansion. He described Ms. Davis as the “genius counterpart to Foster’s vision. Ms. Davis bested 62 applicants for the Norton position. She started her career at the Metropolitan Museum of Art in New York City and spent the past 18 years as the head of the Art of America’s Wing at the Museum of Fine Arts in Boston. She holds a bachelor’s degree from Princeton University, a master’s degree from New York University, and a master’s degree and doctoral degree from Columbia University. Ms. Davis, who took the helm in early March, remarked on how welcoming everyone has been. The Norton had 8,500 visitors on Feb. 9, the day it reopened to the public, and has passed the 60,000 mark to date, she said. The museum features more than 7,600 works of art in five curatorial departments. Ms. Davis gave a brief history of the Norton, which originally opened Feb. 8, 1941 by Ralph and Elizabeth Norton with 740 pieces of art. It was called “the gift of greatest importance to the cultural life of our community.” After Elizabeth Norton died, Ralph Norton remarried. His second wife, Ann Norton, was a sculptor, who gave the community the Ann Norton Sculpture Gardens. The new Norton moved the entrance to Dixie Highway and is flanked by an 80-year-old Banyan tree to the left and a 19-foot 4-inch typewriter eraser sculpture to the right. Ms. Davis said she thinks of the many gifts of art that have been donated to the Norton as a tiny pebble that you drop in a pool of water and the tiny pebble creates ripples that take us beyond our imagination. Directors were offered tours after the luncheon.